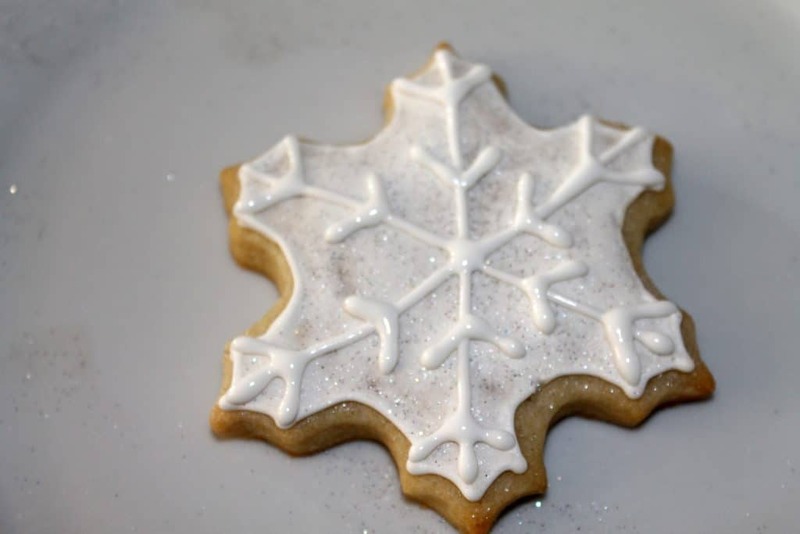 One of the easiest cookies you could ever decorate are snowflake cookies. With the right supplies and my sugar cookie recipe, you can easily create these too! 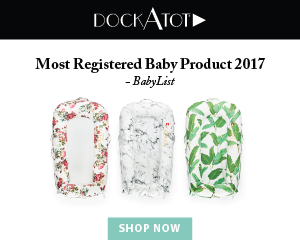 In an effort to fully disclose, this article contains affiliate links to products I use. If you purchase something, I would receive a commission. For more information, see my disclosure page. The first thing you will do is make the sugar cookie dough (my recipe is here). 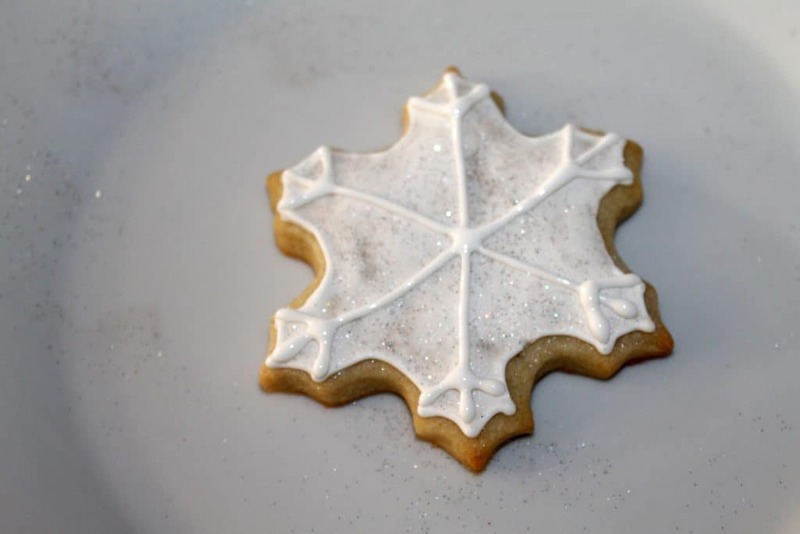 Then, you will roll out the dough and use the snowflake cookie cutter to make your snowflakes. Next, let these freeze for at least 10 minutes so that they hold their shape when you bake them. Then, bake them for 7-9 minutes. When your snowflake cookies have completely cooled, you can begin decorating. Using piping consistency royal icing, pipe the outline of the snowflake cookies. 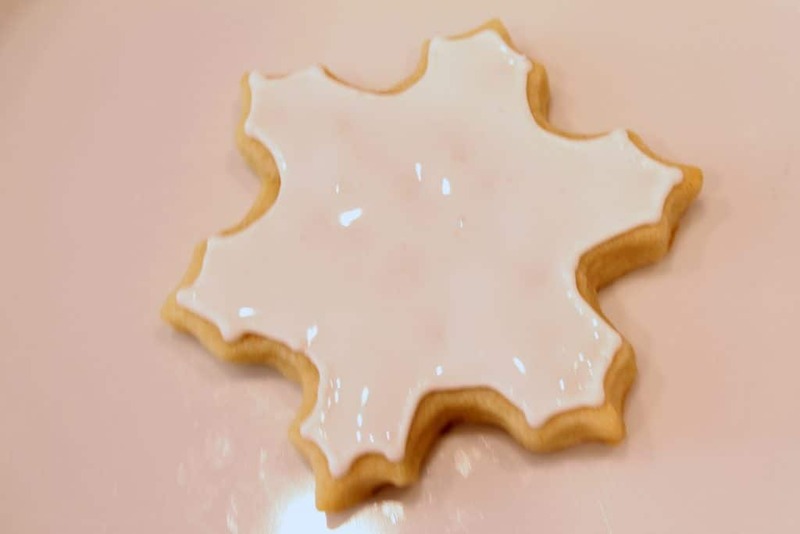 The next step is to use flooding consistency royal icing to fill in the snowflake cookies. This is where using a scribe tool or a toothpick will come into play. 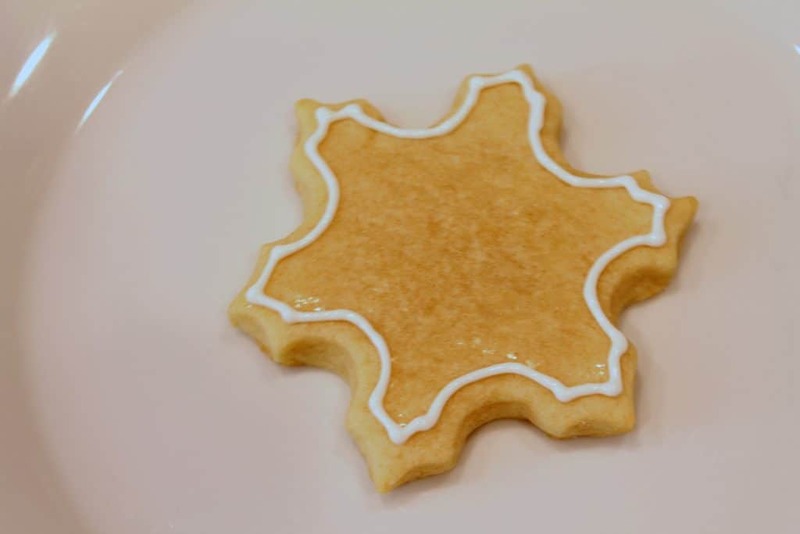 Using a circular motion with your toothpick or scribe tool, help spread the royal icing evenly over the snowflake cookies, adding more as you need. Then, you can do one of two methods. 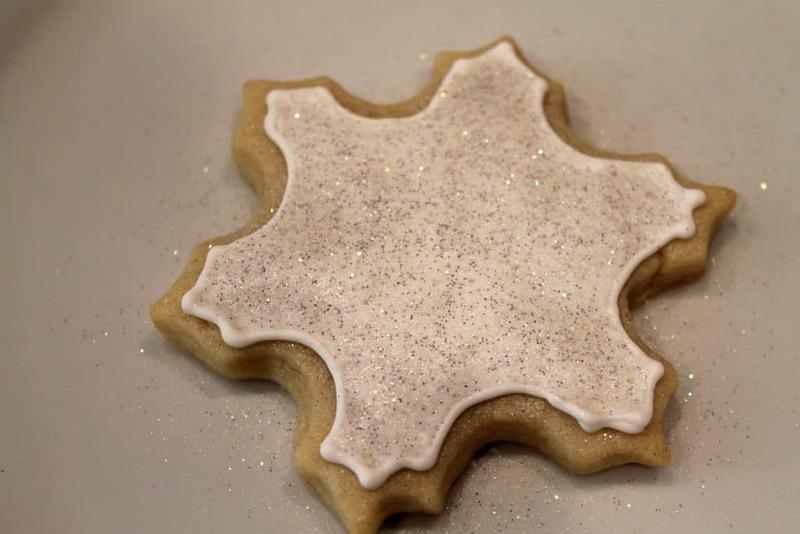 While the snowflake cookies are still wet you can sprinkle some edible silver glitter over them! Or you can wait until the icing on the snowflake cookies dry. Then, you will have more of a shimmering look. The next step to these cookies is to let them sit in an air tight container for an hour (or ideally overnight). 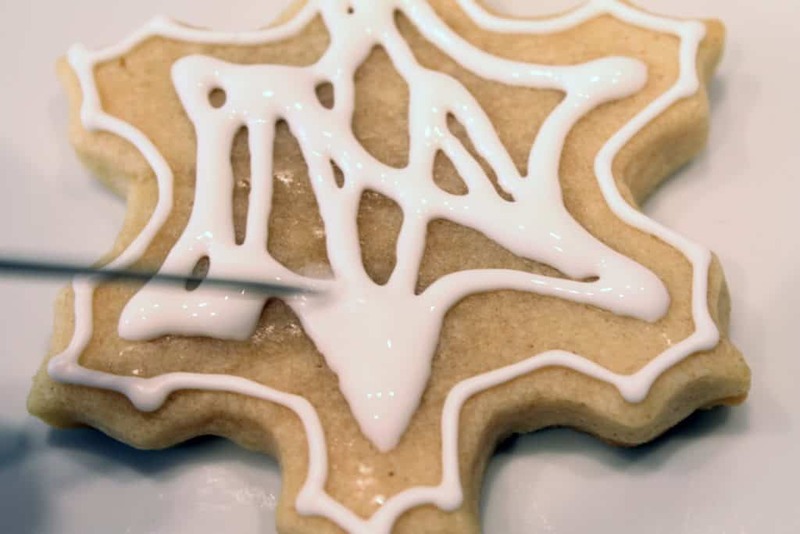 Then, pipe the snowflake details onto the snowflake cookies. 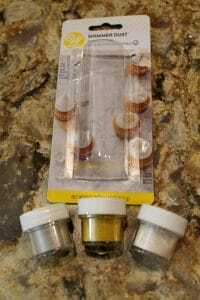 Add in as much detail as you like, and then let them dry for about anouther hour in an airtight contain. Then, the cookie icing should be hard, but your sugar cookie will remain soft! 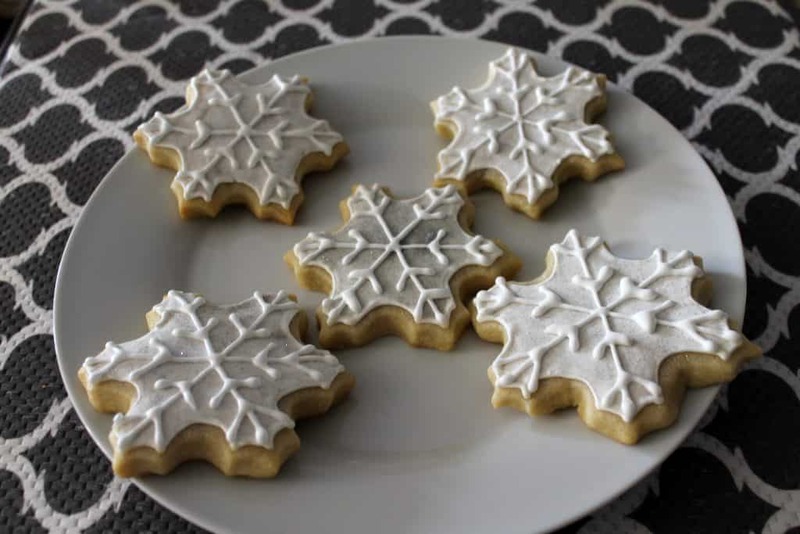 For these snowflake cookies, all you need is white royal icing, but you could also add different colors is you so choose. Mix all of these up in a large mixing bowl, and beat them until they hold a slight peak. Then, split up half the icing into a piping bag. With the remaining half, add a few drops of water and stir until is is the consistency of glue. Place this into the cookie decorating bottle. That’s really all there is to it! 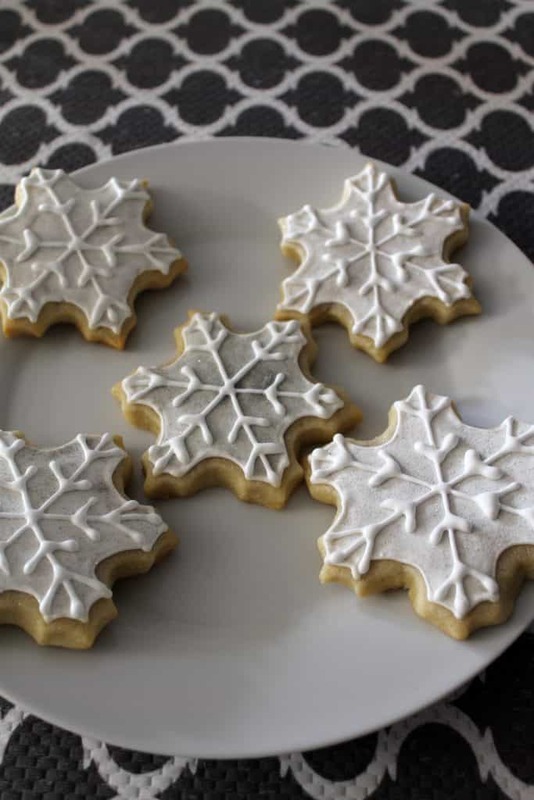 These snowflake cookies are simple to make, but so elegnat to look at. Everyone will just love the glitter detail to these snowflakes. Thanks for stopping by! If you enjoyed this cookie decorating tutorial, please pin it to your favorite desserts board on Pinterest. Thanks!! Sure to have the kids (and adults!) coming back for repeated helpings. Will give this a try. Aww, thank you! I’m sure yours would look just as good. 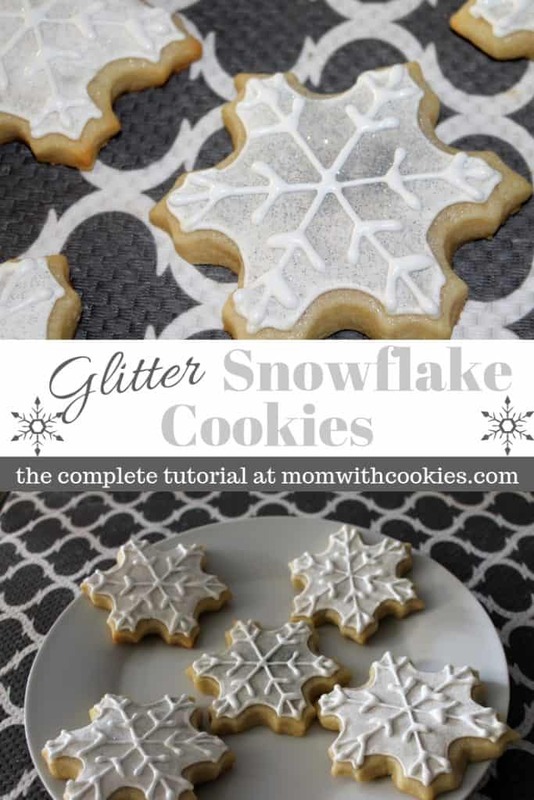 These snowflake cookies are so easy to make!! These don’t seem too daunting! I like the step-by-step pictures! My sugar cookie decor never comes out right. I am saving this post so I can give it a try on Christmas Eve. Wish me luck! I hope these snowflake cookies will turn that around for you! They are really quite easy…and who doesn’t love some edible glitter to really make them stand out. 🙂 Good luck, and let me know how it turns out for you!